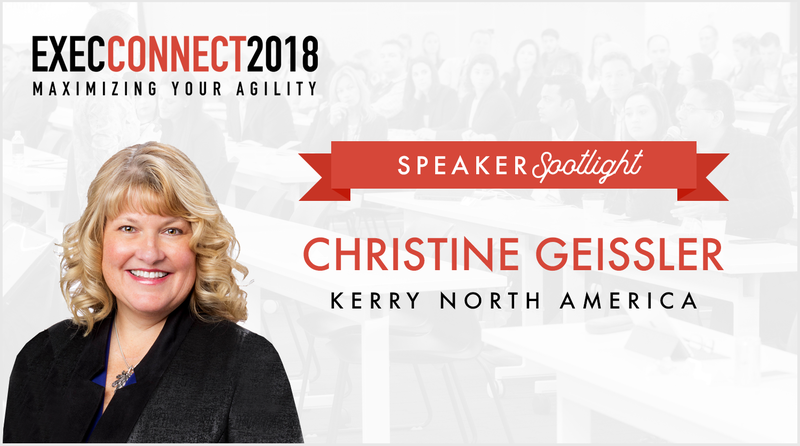 We’re very excited to welcome Christine Geissler, Chief Human Resources Officer/Regional VP HR at Kerry North America, as a featured panelist at ExecConnect 2018! With 30 years of progressive Human Resource experience, Christine has supported all of the product lifecycles in the Food Industry from Retail to Manufacturing and Research & Development; as well as all commercial segments in Consumer Foods, Beverage, Nutrition and PetCare. New to Kerry in 2016, she has a prior 20 year career history with Nestle SA where she has held numerous leadership roles; most recently serving as VP/Chief HR Officer for Nestle Waters NA. Certified in Change Management, Christine is an adjunct faculty instructor for the University of Wisconsin and is passionate about helping to build organizational capability and winning cultures, while helping others grow and succeed. The desire for a change, to keep growing, and to leverage the years of training I’ve had, all leading to a desire to make a difference in a company looking for that type of transformation. People today are looking for learning that is truly just in time, easily accessed and referenced, and specific resources at your fingertips – think “YouTube.” That’s for the “easy stuff.” For the “tougher stuff,” I believe people want mentoring, coaching, simulations – an opportunity for trial and error and a whole lot of feedback along the way. And they want to know you are invested in and investing in them! Tomorrow I head for a Cruise along the Mediterranean and cannot wait. I LOVE to travel and explore the world and different cultures. And I am a people watcher all along the way. Additionally, spending time with my family and close friends is the most important thing to me. So when I can combine friends and family with amazing new experiences, it is heaven on earth!! Since it is my first conference, I am looking to learn and continue to sharpen my own tools; while also having the opportunity to share some of the wisdom I have learned along the way – hoping to help other attendees.